My husband and I had been dating for a long time before we tied the knot. Since we had waited for so long, we were able to have an amazing wedding. We also saved up in order to have the honeymoon of our dreams. We had always wanted to visit Ireland and Scotland. We chose Ireland because it is part of my husband’s ancestry. His roots are deep in Ireland, and he had always wanted to explore them. It was important for him to see the many different aspects of Ireland. He wanted to delve into its rich history, art, architecture, and beautiful landscape. Meanwhile, I had wanted to visit Scotland for as long as I can remember. My paternal grandmother was from Scotland, but she passed away before I was born. I have always wanted to learn more about the country that was her home, because it was a way for me to feel a connection with her. On my wedding day I carried a small picture of her attached to my bouquet so that in a way she was with me as I walked down the aisle. Traveling to Scotland was something of a pilgrimage for me. I wanted to see where my grandmother had come from. I wanted to immerse myself in the culture and learn as much as I could about the food, music, traditions, art, and history. My father told me that I had bagpipe music in my veins, so there was never a doubt about whether or not we should attend the Military Tattoo at Edinburgh Castle while we were in that city. When we began making our honeymoon plans we were still finalizing the details for our wedding. Because I was overstressed, my husband took charge of planning our trip. Most of the details were unknown to me until we were on the honeymoon, which made it all the more amazing and romantic to me. He said he wanted to give me the full “fairy tale experience”, and he certainly did. I truly felt like a princess as we toured and slept in castles. Our trip was a great way to sample what each country had to offer. While in Ireland we stayed in a different county almost every night. In Scotland, we spent time in both the cities and the Highlands. This gave us a great flavor of each country. Our honeymoon began as we flew to Ireland on August 15, 2011. Our first stop was St. Brigid’s Cathedral in Kildare. We went to St. Brigid’s Cathedral because it has historical significance. Before becoming a Christian Cathedral it was a pagan shrine. Today it has the tallest round tower in Ireland that visitors are still able to access. The view from the top was spectacular; it was our first chance to look out over the beautiful Irish countryside. Standing on top of the tower was very peaceful – exactly what we needed to decompress from the wedding. When the proprietors learned that we were on our honeymoon, they allowed us to ring the church bells as a way to celebrate our recent nuptials. It was our first experience of Irish hospitality, which we enjoyed throughout our trip. After the Cathedral we went to Kilkenny where we ate lunch at the Kyteler’s Inn. We chose this restaurant because it had once been owned by a woman who was tried and convicted of being a witch. Not only was there an interesting story to learn as we ate our meal, we also enjoyed the ambiance. Set in a courtyard with a glass canopy it gave the feeling of being outdoors, yet retained all the comforts of indoor dining. Next we walked to the Kilkenny Castle. Here we took a tour and learned about the functions of the different rooms, as well as the furnishings. Afterwards we strolled in the gardens and admired the beautiful fountain. As the day was coming to an end we drove to Waterford Castle, where we would spend our first night. The current Waterford Castle dates back to the 15th century and has 19 elegant bedrooms. It is situated on its own private island, and can only be accessed by a ferry. We feel privileged that we were given the Glin room, which is at the top of the tower. This room contained a charming window seat and had a lovely view. Even the bathroom was impressive as the fixtures were covered with painted birds, butterflies, & flowers. The interior of the Castle’s decorations included tapestries hung on the walls and the grounds were lovely. What could be more romantic? On our second day we went to Blarney Castle, where we enjoyed walking the grounds and exploring Blarney. We had the opportunity to learn about the history of the Castle, and we couldn’t resist kissing the blarney stone while we were there. In addition to this we spent time admiring the “poison garden.” This interesting twist on landscaping gave us the chance to learn about many different types of exotic and dangerous plants. From Blarney Castle we drove to Killarney and took in the scenery on the Ring of Kerry. Having grown up near large cities, it was very relaxing to see the rustic environs. The mountains and valleys were breathtaking, and we loved watching the sheep all along the drive. It amused us to have to stop while some sheep wandered across the road. This was a wonderful way for the two of us to spend some quiet time together. 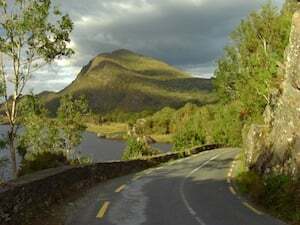 Finishing our drive around the Ring of Kerry, we retired to the Killarney Plaza Hotel for the night. The hotel was well appointed and included modern conveniences such as Wi-Fi access. This gave us a chance to send a quick email to the folks back home to let them know what a great time we were having. The next day we made our way to the Rock of Cashel. We were excited to visit this site because of the important role it has played in Ireland’s history since the Kings of Munster ruled. One of the highlights of the tour was seeing the real St. Patrick’s Cross; it dates back to the 5th century. We enjoyed the scenery and the view of the countryside. Also, my husband loved seeing so many high crosses in the cemetery because he likes seeing the intricate Celtic designs they are covered in. We followed this visit up with a medieval banquet at Bunratty Castle. We were welcomed to Bunratty Castle with a goblet of mead. This was especially appropriate because in medieval times newlyweds traditionally drank mead each night for a month as a fertility rite. In fact, the term honeymoon is derived from this tradition because mead is made from honey and the moon takes a month to complete one cycle. My husband had been searching for mead all around Ireland and this was our first chance to enjoy some. During the banquet we were entertained by musicians, including a harpist, and singers performing traditional songs. From Bunratty we went to our next lodging at Dromoland Castle. As we approached the castle I was in disbelief that we would get to spend the night in such an amazing place. It is an impressive building which looks as if Lords and Ladies still reside in it. Dromoland Castle dates from 1515, and has had several additions to it over the centuries. We were privileged enough to have a room in the oldest part of the castle. Not only were the accommodations and view spectacular, we enjoyed exploring the rest of the grounds as well as the interior of the castle. I was impressed with the furnishings throughout, as well as the grand staircase, stained glass windows, crystal chandeliers, and vaulted ceilings. It was truly palatial. The service was also impeccable. Not only were all of the employees friendly and helpful, they went above and beyond. For example, when we entered our bedroom we found the television on with a message to welcome “Mr. and Mrs. O’Connell.” On the table was a box of nine gourmet chocolates, along with a card congratulating us on our recent nuptials. This made us feel like royalty. On our fourth day we drove to Thoor Ballylee, the summer home of W.B. Yeats. It is a tower house castle next to a stream in a rural area. It was very peaceful and we can imagine how relaxing it would be to summer there. It isn’t hard to understand why a writer would choose a place such as this for the inspiration it gave forth. From there we went to visit the ruins of Roscommon Castle. Roscommon Castle was built in 1269 and was destroyed in 1690. Most of the outer shell still stands as a testament to an earlier era. 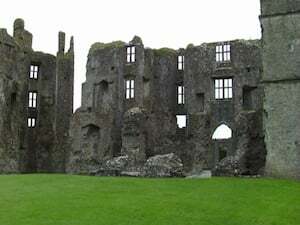 Both Thoor Ballylee and Roscommon Castle are off the beaten tourist tract, but that made it special to us. There were no lines to stand in, and we were able to be secluded and enjoy discovering these hidden treasures on our own. From here we went to spend the night at Ashford Castle. As we made our way up the long entrance drive from the street we were both impressed with the beauty of the grounds and the impressive architecture. Once inside we couldn’t believe what a wonderful room we would be staying in. Not only did we have a spectacular view of the gardens and Lough Corrib, but we had an upstairs sitting room. It was truly impressive. We took a break from heavy travelling and spent all of the next day at Ashford Castle. Ashford, once owned by the Guinness family, dates back to 1228 and is located by Lough Corrib and the Cong River. The list of famous guests who have stayed at Ashford reads like a Who’s Who of the rich and famous: Barbara Streisand, Edward V, and Princess Grace, just to name a few. We took advantage of many of the amenities Ashford had to offer. After strolling in the gardens we both took falconry lessons. This was an amazing experience for both of us. We learned all about these magnificent creatures, and being able to handle them gave us some truly unbelievable memories. Neither of us had the chance to do anything of the sort before. There is nothing like learning to control one of these Harris Hawks. I’d say that watching them fly up close is only surpassed by having them rest on your arm and giving them commands. After our lesson we enjoyed exploring the Castle both inside and out. We were able to have an authentic afternoon tea in the castle’s drawing room. How could I not feel like a princess? We enjoyed the delicious scones with clotted cream, finger sandwiches, and desserts. Later we found time to relax using the sauna, steam room, and Jacuzzi. It was the perfect way to take some time to relax and relieve some of the pent up post-wedding stress. 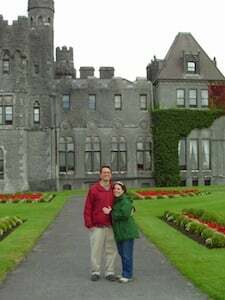 Ashford Castle was our favorite accommodation in Ireland. In the morning we drove to Dublin to enjoy the city’s attractions. We took a Viking Splash Tour of Dublin aboard a World War II amphibious vehicle nicknamed a duck. This unique tour gave us the chance to see Dublin from both land and water. Our tour guide pointed out highlights of the city that we would later go to discover in detail. After the tour we shopped on Grafton Street and enjoyed the street performers. No honeymoon trip to Dublin would be complete without crossing the Ha’penny or “kissing” Bridge. We spent the night at the Alexander Hotel. The location of the Alexander was ideal because it is in walking distance to the main attractions of Dublin. We spent the next day exploring the beautiful city of Dublin in greater depth, including a walk down O’Connell Street. This was especially important to us, because O’Connell is the last name we now share. We also took a tour of Dublin Castle where we saw the throne used by Queen Victoria. It was interesting to learn about this building’s role in Irish history throughout the years, and that it is still used for state functions. Next, we relaxed in St. Stephen’s Green and enjoyed the beauty of the park. We retired back to the Alexander for the night anticipating the next portion of our trip: Scotland. Early the next morning we flew to Glasgow, Scotland to begin the next leg of our journey. In Glasgow we walked down Sauchiehall and Buchanan Streets. We did some window shopping in the Argyll Arcade and discovered Sloans, the oldest bar and restaurant in Glasgow dating back to 1797. Since we were in Scotland, we had to have an Irn Bru, a soft drink only available in that country. We then headed over to the Kelvingrove Art Gallery and Museum, which has an eclectic collection. We especially liked the Neolithic Era Exhibit, which included tools and a boat from that time period. We were fascinated to be able to stand so close to such ancient objects. We stayed at the Thistle Hotel, conveniently located downtown. At the Thistle we were able to take advantage of the large swimming pool and sauna. 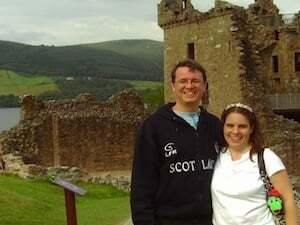 We began the next day travelling up to the Highlands, making stops along Loch Lomond and cruising Loch Ness before touring the Urquhart Castle ruins. The mists in the hills and valleys were awe inspiring, and though we did not see Nessie, we were not disappointed on our travels. It was not difficult for me to imagine what life would have been like for my ancestors as I took in the beauty of the landscape. We checked into the Newton Hotel and got the Charlie Chaplin’s Suite, so named because the star often stayed here. When we opened the door the first thing we saw was a coat rack with Charlie Chaplin’s iconic hat and cane. We had a beautiful view, and the suite was well furnished including a claw foot bathtub and a four poster bed. We enjoyed a traditional Scottish dinner. This included haggis, tatties, and neeps, which also happened to be the name of the three Highland Cows kept on the premises. Highland cows are unusual looking because they have long hair, which keeps them warm in the cold climes. Evening entertainment consisted of traditional bagpipe music and highland dancing. On the next day, we visited Culloden Battlefield and learned a lot about the history of Bonnie Prince Charlie. Being a history buff, I was thrilled when I was chosen to participate in a demonstration in the visitor center about entering the King’s Army. We contemplated the battle that took place and took note of the clan markers on the field. It was a sobering experience to think of all the carnage that occurred on these grounds to determine who would be the rightful King. We were able to take an audio tour that provided details about the battle as well as the monuments. Standing on the open field it isn’t hard to imagine the two sides facing each other. The tranquility of the field belies its historical significance. No trip to Scotland would be complete without visiting a Scotch Distillery. We went to Blair Atholl Distillery where we learned about the production of Scotch, and had a “wee dram” at the end of our tour. We traveled to Edinburgh and ended our evening with a ghost walk through downtown. This included a stroll through Greyfriar’s Cemetery and we learned about some notorious figures in Edinburgh’s history. We retired to the Marriott Dalmahoy for the night. Just outside of Edinburgh, the Marriott Dalmahoy provided the perfect combination of modern conveniences, relaxation (such as the whirlpool), and beauty. On what was supposed to be the final full day of our honeymoon, we took a bus tour of Edinburgh. We took note of the highlights of the city that we would later explore in more detail. We visited Edinburgh Castle and enjoyed seeing the Honours of Scotland including the Crown and the Stone of Destiny. We were able to walk through the dungeons and see how the prisoners were treated. We went inside St. Margaret’s Chapel which is rather small but very peaceful, and is the oldest building in Edinburgh that still survives. We checked out Mons Meg, a humongous siege gun (bombard) dating from 1449, and a pile of gunstone, before watching the firing of the one o’clock gun. We walked along the Royal Mile and climbed all 287 steps of the Sir Walter Scott Monument. From this lofty height we were able to take in the amazing view of Edinburgh Castle, the Princes Street gardens and the rest of the city. We ended the day with what was to be the highlight of our honeymoon, the famous Royal Edinburgh Military Tattoo. It was spectacular to see all the different bands from around the world. One of our favorites was a band that performed their instruments while riding bicycles. The most poignant part of the evening came when the lone piper played Scotland the Brave from the top parapet of the Castle. This was the perfect finale to our honeymoon. We returned to the Marriott Dalmahoy to spend our last night before flying home at 6am. Just as every concert has an encore, so did our honeymoon. On August 27, we arrived at the airport only to find that Hurricane Irene had caused our flight to be canceled. Menzies, the service provider for Aer Lingus airline, told us that they were unable to help us since we had booked through a travel agent. It was the middle of the night back in Connecticut, where our travel agent was located, so we had to wait hours before they would open. Once we were able to establish contact we were disappointed to find that our travel agent could not contact Aer Lingus to change our flights. Not only that, they were unable to find accommodations for us because every hotel in Edinburgh that they have a relationship with was already fully booked. We were hungry, scared, and completely on our own to find a place to stay. Menzies gave us food vouchers so we could buy premade sandwiches. After spending 12 hours in the airport one, of the Menzies employees whom we had dealt with throughout the day helped us to find lodgings in his hometown of Dumfernline. We were weary when we arrived at the Garvock House Hotel, but upon check-in we were greeted by friendly and helpful people who did whatever they could to keep this from spoiling our honeymoon. They made us feel right at home and told us about some local attractions within walking distance. The Garvock House Hotel is a country house that sits on 2 acres of beautiful gardens. The rooms are very pretty, and we had fresh flowers each day of our stay. The Garvock House Hotel was also a great value. While we were there we were able to partake of the “Sunday Treat”. This consisted of breakfast, a three-course dinner, and the accommodations for the night, all for less money than we had spent for just our room at some other hotels. We spent much of the next day trying to contact our travel agent and the airline to figure out a way to get home. Aer Lingus was closed in Scotland/Ireland because of the Bank Holiday, and they had closed their United States call center due to the massive amounts of incoming calls. We wanted to stay close to the phone, and so we didn’t get to explore the town in depth. We took a short walk to the Glen where we stumbled onto the Bruce Festival. This is a medieval faire honoring the first King of Scotland, Robert the Bruce. We were delighted to sample local fare, including a mead which my husband was delighted to find. There were demonstrations of medieval crafts as well as a joust. We felt really lucky to find the Festival because we had no idea that it was there. It was the perfect diversion from our troubles. In the morning, we went to the Abbey Church. We learned about Dumfernline’s role as the ancient capitol of Scotland, and we had the opportunity to visit King Robert the Bruce’s Tomb. We walked the Abbey grounds and saw the ruins of the monastery. We were told about a famous resident of Dumfernline, however it took some time to figure out what our taxi driver had said. In a thick Scottish accent that, it sounded like “AN DROO CAH NAY GHEE”, which we finally deciphered as Andrew Carnegie (my husband at first thought he was talking about Kennedy or Canada). I enjoy reading biographies, and I had read one about Andrew Carnegie several years ago, as well as other magnates. Living close to New York, we have gone to many of the Robber Barons’ homes, but I never thought that we’d get to see Carnegie’s birthplace since it is in Scotland. It was imperative that we visit the Andrew Carnegie Birthplace Museum. It was thrilling to see the cottage where the Carnegie family only had one small room to eat, sleep, and live in. Standing there made me appreciate the humble beginnings Carnegie came from. We also explored the museum’s other exhibits and learned more about his philanthropy, which continues posthumously. Once we finalized our flight home, we were able to spend the entire day exploring parts of Edinburgh, which we hadn’t had the opportunity to see previously. We learned about the city’s architecture in both the new and old sections of town. We went to the Georgian House and saw how the wealthy elite lived in the 18th century. It was very interesting to learn challenges to engineering that went into the plans for buildings and streets in the new section. This is what helped turn Edinburgh into the “Athens of the North.” We followed this up by going to Gladstone’s Landing and we saw what life was like in the old town in a high-tenement house. Each floor of this building gave a unique glimpse into what it was like to live, eat, and shop in Edinburgh many centuries ago. We did more shopping along the Royal Mile including purchasing a kilt with my family tartan (McCallum). Next we took a tour of the Real Mary King’s Close, which took us down under the current Royal Mile. This helped us appreciate how crowded the living conditions really were and the marvel of engineering it took to construct the new architecture right on top of the old structures. We finished our day with dinner at the Elephant House, where J.K. Rowling came up with and wrote the Harry Potter series. This was a special treat for us since we are both Harry Potter fans. We also visited the People’s Palace and enjoyed its architecture. Behind the Palace is the Doulton Fountain. This is the world’s largest terra cota fountain and represents the full reach of the British Empire. The fountain is broken into the four cardinal directions, with each side depicting a colony: India, Canada, Australia, and South Africa. Walking the streets of Glasgow and touring the tenement house was very meaningful to me as this is the town my grandmother grew up in. With each step I took I wondered if I was seeing the same buildings and visiting the same places that my grandmother had in her youth. This was the reason we had come to Glasgow! On August 31 we flew back home. We had had an unforgettable honeymoon, both the portions we had planned and the unanticipated extension. When planning our honeymoon, my husband tried to create the full fairy tale experience. He did his job well because the places we visited and activities we participated in left me feeling like a real princess. We would strongly recommend a trip like ours to anyone who is interested in art, history, Celtic traditions, or romance. Our trip cost approximately $11,000. This included accommodations at five-star castles, airplane tickets, and the unexpected five-day extension to our honeymoon. Although we hated for the trip to be over, we were ready to get back to normal and begin our next journey together as husband and wife.